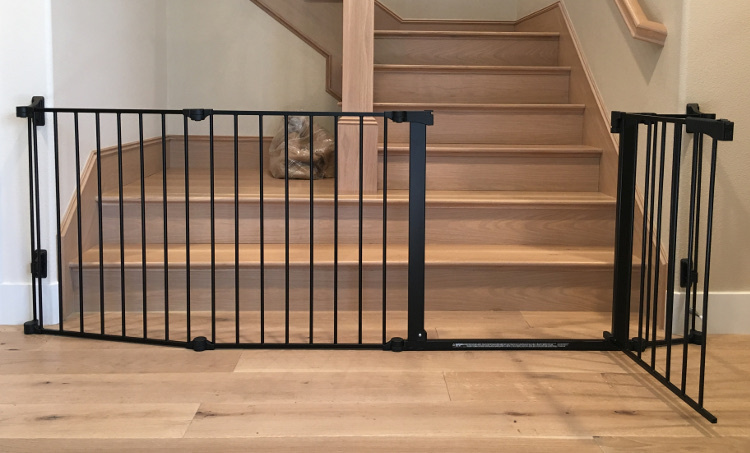 Custom installation bottom of stair toddler safety gate for and extra wide opening. 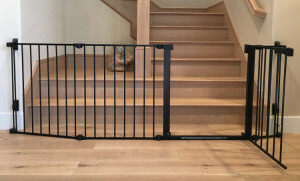 Toddler safety gate was installed at the bottom of stairs for an 86″ wide opening. The baby gate has a walk through door which has a hold open posintion for easy pass through when baby is not present. Child safety gate also features an auto locking door. Toddler safety gate can be easily removed for entertaining and cleaning. If you need help with a child safety gate for your stairs, please contact your local Baby Safe Homes safety professional. We would be happy to assist you with your childproofing needs.